It took only a few minutes for this film to turn me off so completely that I stopped watching. 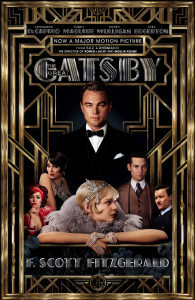 It gave the impression of someone who read F. Scott Fitzgerald‘s The Great Gatsby and hated every single page, and so decided to make a movie that took a completely contrary view of the “Jazz Age.” Fitzgerald was an astute critic of the upper classes. This movie adores the upper classes, and crams as many CGI effects (WTF!!!!) into every scene as possible. Hip hop songs, cartoonish sets and exaggerated caricatures abound. I keep thinking that somebody wanted to make this like the movie Moulin Rouge! Sure enough, this is directed by Baz Luhrmann, director of Moulin Rouge! Luhrman’s craft has hardened into formula by this point. The big scenes all have a telescoping zoom shot done in CGI, focusing on a microcosm of a larger, bustling world. This makes it seem like there is a focus on just on corner of the world, but really the tone is that this is a representative view of the world, that one could look anywhere and find the same basic “human nature” at work. The past is portrayed as a version of the present with different fashions — implying that the present is pre-destined. Luhrmann is an arch conservative, so it makes sense that he would balk at a sympathetic reading of Fitzgerald’s story. This film is an abomination and should be viewed by no one. Next Next post: Methodman & Redman – Blackout!